Each food intake leads to a rise of carbohydrate (glucose) in the blood, which will be used as energy by the body. This rise of glucose normally triggers the release of insulin. Thanks to insulin, the body cells let glucose come in, and transform it into energy. The level of sugar in blood the glycaemia, is partly regulated by insulin. Once glycaemia goes back to its target value, the blood levels of insulin drop off. Glycaemia must be precisely regulated to remain in its narrow range, so that the body can function optimally. Diabetes is characterized by an abnormally high glycaemia. When glycaemia chronically outreaches a defined threshold, there is an increased risk of developing adverse long-term effects. These damages and dysfunctions are often related to eyes, nerves, heart, kidney and blood vessels and they are the common symptoms of diabetes. In the world, about 415 million people have diabetes. By 2040, this number has been estimated to reach 642 million people, which makes it a global health concern. Type 1 diabetes or T1D is a form of diabetes where the body does not produce enough insulin. This condition often outbreaks during childhood or adolescence. Type 2 diabetes or T2D is a chronic form of diabetes where the insulin produced isn’t efficient enough. T2D whether occurs when the body can’t produce enough insulin or when the body cells become resistant to insulin. Most cases of diabetes are T2D. T2D usually occurs after the age of 45. Nevertheless, the rise of obesity, especially among children, may lead to a rise of T2D which could become a major public issue. Gestational diabetes mellitus or GDM is a condition occurring during pregnancy, linked to glucose intolerance and insulin resistant. This condition is usually diagnosed within the second semester of pregnancy. GDM is normally temporary but it is associated with higher long-term risk of developing T2D. Diabetes and pre-diabetes are usually diagnosed using both the “fasting plasma blood glucose” (FP BG), and the glucose value measured 2 hours after ingestion (2-Hr OGTT). The figure below summarizes the differences between no diabetes, prediabetes and diabetes. When the fasting plasma glucose level is higher than a level that would minimise health risks, it is said that the patient has high blood glucose. Apart from drugs and insulin injections, given when necessary, lifestyle matters a lot. The World Health Organization (WHO) states that moving to a better lifestyle will both reduce the occurrence of obesity and T2D, and reduce complications for all diabetics. Therefore, the WHO advises people to combine healthy diets, physical activity, and medication if needed, in order to monitor blood glucose level. For Type 2 diabete (T2D), it is advised to keep an eye on your diet in order to keep from excessive postprandial glycaemic responses. And this is is harder than it seems. Indeed, focusing on calories and nutrients is not enough to watch over your diet. Let’s take the example of proteins. Protein content can lower glycaemic response by increasing insulin secretion. But this effect depends on the source of protein, and insulin is not the only factor involved in glycaemic management. Each food can be characterized by a value called glycaemic index (or GI). It refers to how fast glycaemia rises after eating a particular food. GI fluctuates between 0 and 100, 100 corresponding to glucose. Food with higher GI will increase blood sugar levels the most. How can IG support diabetics in their everyday life? Because high-glycaemic foods induce a quick spike in blood sugar levels, it is advised, especially for diabetics, not to eat too much food with high GI. Actually picking low GI meals help people to reduce the GI of their diet. For example, a plain yogurt is a low GI food. Its blood sugar response will not be high. We may also mention that plain and sweetened yogurts have lower GI than what one could expect with its carbohydrate content. The IG is 27 for plain yogurt and 41 for sweetened yogurt. Several explanations have been suggested. First the lactic acid of the yogurt may slow down gastric emptying and therefore reduce glycaemic response. Then the amounts of fat, proteins and nutrients, known to reduce glycaemic response, may also be involved. That is why switching from product with added sugars to yogurt is a healthy choice. GI is commonly used but there is another value to describe sugar intake. The glycaemic load or GL is calculated with the GI and the amount of carbohydrate of the food consumed. Can yogurt prevent from T2D risks? Available data indicate there may be a beneficial association between yogurt consumption and Type 2 diabetes. 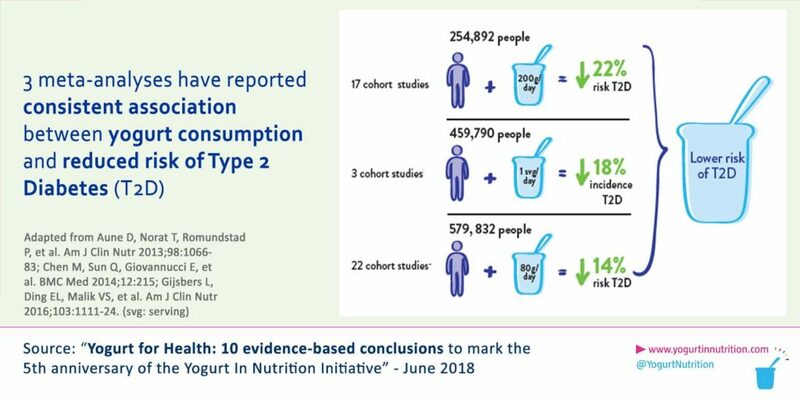 A large scale study has also showed that yogurt could help reducing the prevalence of Type 2 diabetes: when the frequency of yogurt consumption increases, the risk of getting T2D declines in a linear relationship. Also, as shown in figure 2, yogurt is linked to a healthier insulin profile in children and teenagers. Yogurt contains live bacteria which, by influencing the gut microbiota, may reduce inflammation. And inflammation is linked to T2D. Yogurt contains vitamin K2, especially whole-fat yogurt which has up to 28 μg per 100g. The chances of developing T2D decrease by 7% for each extra 10 μg of vitamin K2. Yogurt has a low GI (Glycaemic index), and therefore doesn’t lead to a spike in blood glucose after ingestion. Other studies have shown that yogurt fortified with vitamin D is associated with an improvement in both insulin resistance and lipid metabolism in pregnant women having Gestational diabetes. Consuming yogurt supplemented with vitamin D on a daily basis may easily improve GDM (Gestational diabetes mellitus).